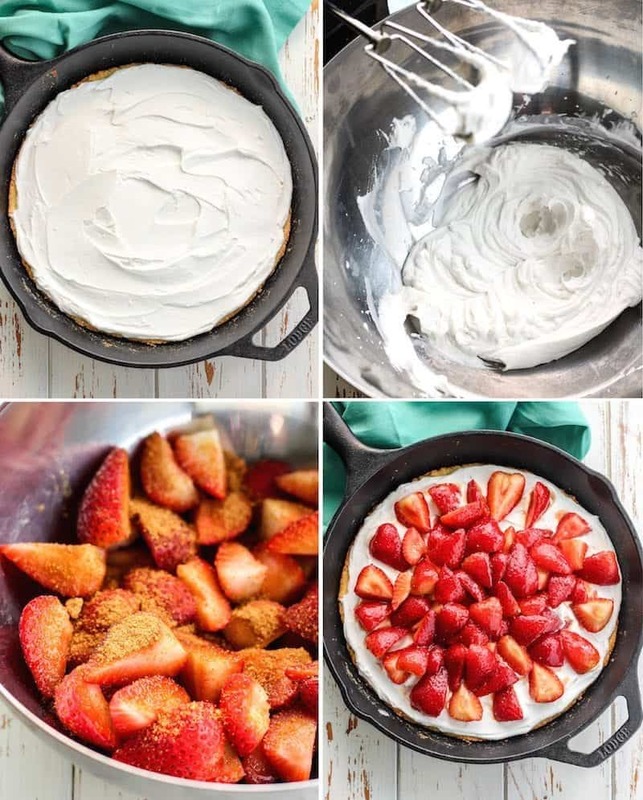 Paleo Strawberry Shortcake! This is so unbelievably good, and simple too. Made using coconut flour, coconut cream, and strawberries, of course. Lower in carbohydrates, gluten-free, dairy-free and refined-sugar free. It is a must make this summer season! Strawberry shortcake. What’s not to love about this light summer dessert? It is a favorite of mine. I believe it was this seasonal dessert that got me liking strawberries when I was a kid <- remember when I told you I was picky? I remember being over at a friend’s house, and we helped her mom make strawberry shortcake, with biscuits and cool whip. I remember thinking “Oh yeah, I DEFINITELY like strawberries now.” Of course I did when they were covered in sugar, duh. I also had a thing for cool whip. My Nana would let me have bowls of cool whip like it was ice cream. And I’m talking BOWLS… plural… To my future grandchildren, that will not happen for you. Once you bake the coconut flour shortcake, allow it to cool in the fridge for about 20 minutes, or overnight. During this time you can whip up the chilled coconut cream and toss the strawberries in the coconut sugar. Once the cake has cooled, spread the coconut cream on and layer up those berries! The coconut sugar is certainly optional if you’re looking for an even lighter dessert, but I was going for a mix of healthy shortcake with a side of traditional 😉 The coconut sugar makes the strawberries extra juicy, and this cake seriously irresistible. 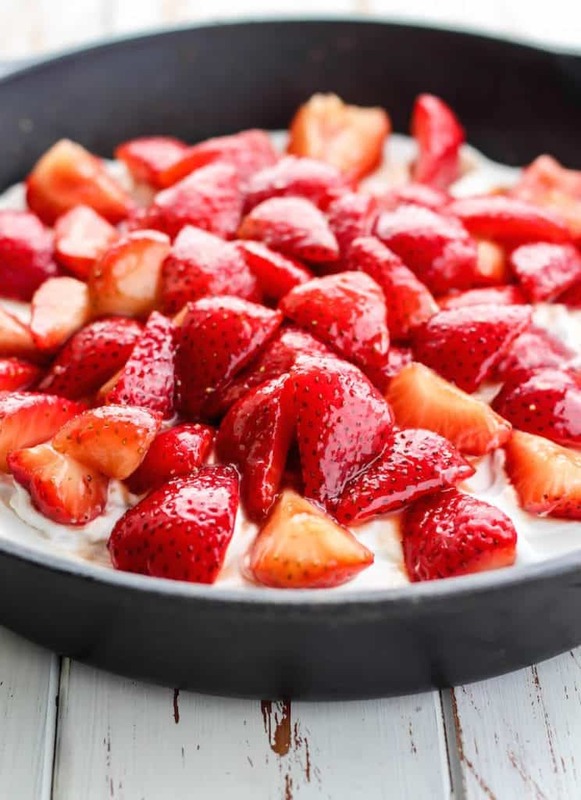 Showing peeps eating healthy is delicious with this #paleo strawberry shortcake. I kind of can’t get over how good this cake turned out. I was a little skeptical adventuring into coconut flour land again. But I was set on making a grain-free and dairy-free version of this summer favorite for you all. Thankfully the coconut flour didn’t give me too much trouble and it came out awesome the first round! The trick with coconut flour is you have to be pretty precise. I meant to measure out in grams but I forgot, soorryyy. But you’ll need JUST a half cup. Not a heaping half cup, just a regular measured half cup. Then there is lots of liquid in there from the eggs, coconut oil, maple syrup and milk. You could sub agave or honey for the sweetener, but I don’t recommend using a dry sweetener, or you are likely going to be missing out on the wet ingredients. And if you’ve baked with coconut flour before, you understand how important it is to have those wet ingredients add up. Note that while I used a cast-iron skillet, you should be able to use a 9″ round baking dish/pie plate. Just watch your baking time and check center with toothpick! Paleo Strawberry Shortcake! This is so unbelievably good, and simple too. Made using coconut flour, coconut cream, and strawberries, of course. Lower in carbohydrates, gluten-free, dairy-free and refined-sugar free. It is a must make for the summer season! Preheat oven to 350F, generously grease 9″ baking dish or skillet with oil and set aside. In a medium bowl, sift together coconut flour, baking powder, and salt. Stir together to make sure no clumps are present. Set aside. In a large bowl whisk together eggs, coconut oil, vanilla extract, maple syrup, and milk. Add in bowl of dry ingredients and use large spatula or spoon to stir together until dry. Batter wet and slightly thick. Pour batter into greased dish and bake shortcake for 18-22 minutes, checking with toothpick in middle for crumbs. Edges should be slightly browned and cake completely set when done. Transfer shortcake to fridge and allow to cool for at least 20 minutes, or covered overnight. Toss quartered strawberries in medium bowl with 1 TBS coconut sugar and allow sugar to dissolve, about 5 minutes, set aside. When the shortcake is cooling, make your whipped cream layer: Carefully scoop out chilled cream into large bowl. (Discard liquid or save for smoothies.) Using hand mixer or stand mixer with whisk attachment, whip cream until light and fluffy for about 5 minutes. 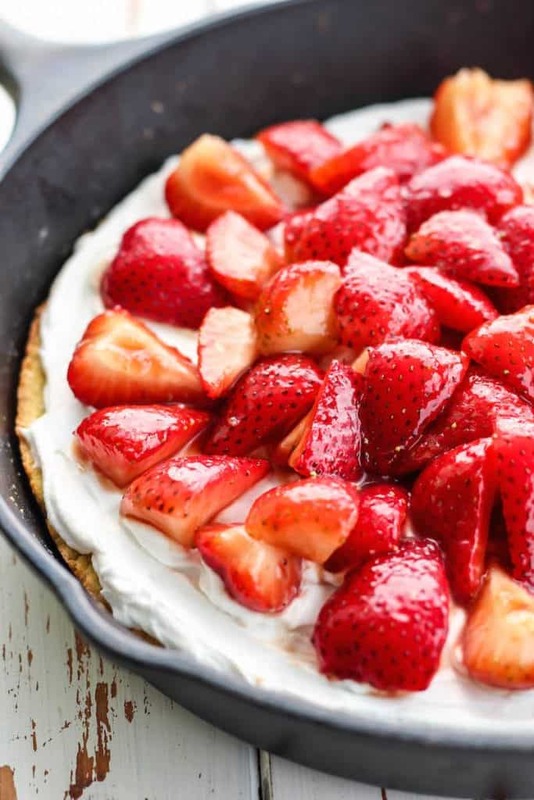 Using large spatula spread cream evenly over shortcake, and cover with juicy strawberries. Slice and enjoy! Shortcake is best served fresh, but may be stored in fridge covered, 2-3 days. I opted for a cast-iron skillet, you can also use a 9″ pie dish, or cake pan. Just watch your baking time. Do you like strawberry shortcake as much as I do? Any special baking memories you have as a kid? yes i Love strawberry shortcake and this one is beautiful! Also love that you made it with coconut flour too! Thanks Rachel! I seriously loved this dessert so much. Can’t wait to make it again. I LOVE strawberry shortcake, but I never thought a paleo version was possible! You’re a genius! Strawberry shortcake has always been a staple dessert for the summertime when I don’t feel like putting a lot of work into something. Lol at my laziness! Say whhaaa?! You must try it Brie!! –those ice cream bars sound legit though. I’ve just gotten into using coconut flour and it still scares me… but this looks wonderful and I cannot wait to try it out!! Don’t worry, I still don’t really like strawberries…at least not by themselves. It’s just so hard to get delicious ones that I’ve just given up. This looks amaaaazzing! What a fun memory too! I am the baker in my family and growing up my Mum never baked anything other than “Fay’s Banana Cake” – her friend’s incredible banana cake recipe that she’d surprise us with sometimes after school or when we were on school holidays (like summer vacation only we have four breaks a year!) but I do remember my first baking and cooking experiences with my next door neighbour as a child who would call to me over the fence to come over to her house and bake scones or cook pikelets with her in her tiny little kitchen on her electric griddle. I still think of her whenever I make or even see pikelets (mini pancakes) today! Ah I’ve never heard of cook pikelets! That sounds fun too. Thanks for sharing Kristy! Ashley, this looks amazing! I love good summer strawberries and finding different ways to use them, and coconut flour is so fun (and sometimes disastrous haha) to bake with. Haha disastrous it can be but it always feels good to conquer the recipe. –So glad I am not the only crazy one who was obsessed, lol. How could anyone not like strawberry shortcake. Looks delicious Ashley. I don’t know! They’d be crazy to me. Well, I used to be a super picky kid, and I thought that fruit never belonged on a cake! So weird, right? It’s why I wasn’t a huge fan of pie as a child unless if it didn’t have fruit! LOL! But now I absolutely love cakes with fruit, and strawberry shortcake tastes pretty good too! This looks so good–better than the real thing! This looks amazing! I was thinking of doing a cup cake size version for my daughter’s first birthday… any idea how long it would nee to bake? Oh that would be so cute! I haven’t tested them in a muffin/cupcake pan myself but I would guess maybe 8-10 minutes? The edges should be slightly golden. Also, these won’t really rise much–they’re more of a cross between a biscuit and a shortbread cake. Let me know if you try it though! One of the best coconut flour cakes I have made. I didn’t follow the recipe after the cake, though I followed the basic idea. 🙂 As much as I enjoy coconut flour sweets, there is almost always that certain thick, hard-to-swallow- sensation as I eat it. This is the first I’ve found that didn’t feel that way! Very good. Thank you. Could you elaborate more on the nutrition? How many calories? Hi Misty! Sorry about that – I recently changed my recipe card and that information didn’t transfer over. So 1/10 of the shortcake is *approximately* 196 calories, 15g fat, 12g carbs 8g sugar and 4g protein. Again a rough estimate based on products used. Hope that helps! Hello Ashley, thank you very much for sharing this inspiring paleo recipe. I didn’t know paleo cakes can actually taste that good. The cake turned out very well at our first attempt already. We experimented the following weeks and modified the recipe a little by time. It ended up being rather a biscuit cake. The recipe of the topping is still identical to yours. For the cake we now use 6 eggs, 1/3 cup of honey, 1 cup of coconut flour, 1 tsp of baking powder and 1/2 tsp of vanilla powder. Hi! I admit that I reluctantly served the family pound cake for strawberry shortcake the other night but I had just fruit and homemade whipping cream. I had leftover fruit and decided to hunt myself a paleo shortcake to make. FOUND IT!!! Made it as written using almond milk and a 10 inch pie plate. PERFECTION!!!! This is so good that I could eat the whole thing myself! Thank you so much. I will be checking out your other recipes for sure!! I’m not sure what happened but my attempt at whipping the coconut cream was a major fail! I chilled it and the top 1/3 looked like hard coconut oil so I poured the liquid into a bowl and began to whip…and whip and whip and whip. Nothing happened so I added the hardened oil which merely got stuck to the bottom. Is there something I did wrong? Well, clearly there was, but the question is “What did I do wrong?” The cake is amazing btw! Hi Maureen! So sorry you had trouble with the coconut cream! So the top hard coconut top was actually the cream, it was probably just too hard to whip. Next time that happens you can allow the coconut cream to sit so it softens enough to whip. Again, sorry you had trouble! I’ll have to make a note about what to do if the cream is too solid. Thank you for your comment! I appreciate your feedback 🙂 and I’m glad you still enjoyed the cake! And started mixing. Same problem. Hopefully I can figure it out! Lol! Sorry about that Dena! I’ll make sure to update the recipe to provide more specifics regarding the coconut cream. I’ve made this twice now. DELISH!!! I’m so glad you have enjoyed it so much Jo Ann! Thank you for letting me know, I appreciate it! Couldn’t figure out to leave my 5 star review so I’ll just comment and say this was a great dessert option to meet my dietary needs but still something my husband and our friends can enjoy. They had real whipped cream but the coconut cream was delish! Will definitely be making again. Thank you! Thanks so much for the comment and review Erin! I really appreciate you taking the time to leave a comment 🙂 I am happy it was so well received! The cake has a good texture but it tasted too eggy. Unfortunately I am no certain how that would turn out with coconut flour – it is super absorbent and I am not familiar with replacing eggs in coconut flour baked goods. This strawberry shortcake is wonderful!! My whole family loved it! I made it to recipe the first time but this time I am substituting So Delicious Coconut milk whipped cream to make it a little easier, so I hope it’s as good! Awesome Tracey! 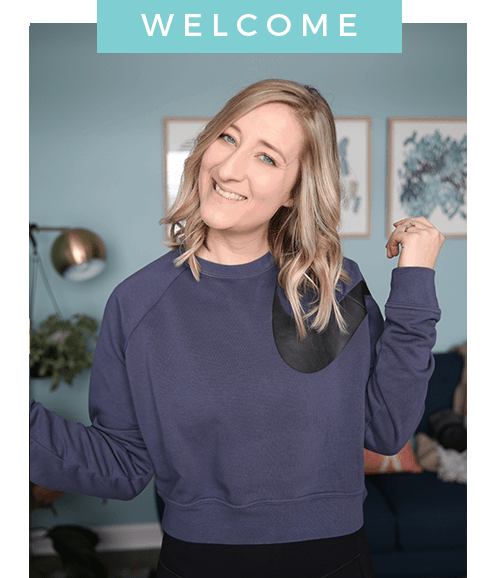 I am so glad you enjoyed it – thank you so much for taking time to leave a review! And yes – I’ve had that whipped cream before and it is delicious! I am sure it will go over just as well 😀 Happy 4th of July! 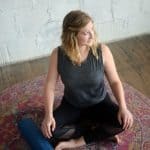 I’ve been eating Paleo for a little over a year now with all of the benefits that were promised before I started. However, I don’t particularly have a sweet tooth so I just gave up desserts when I made the decision to change my eating habits. However, my husband craves sweets and mentioned that he had purchased an abundance of strawberries. He asked what I thought that I could do with them so I went online and found you. This recipe is AMAZING!!!! Not only is is fast and simple, it tastes wonderful. This will become a summer staple for us. Thank you so very much for your efforts.